With Thanksgiving approaching fast, here are some ideas for potato side dishes. We love potatoes and I make a side dish of potatoes of any kind at least twice a week. So, there are plenty of recipes for you to choose from. 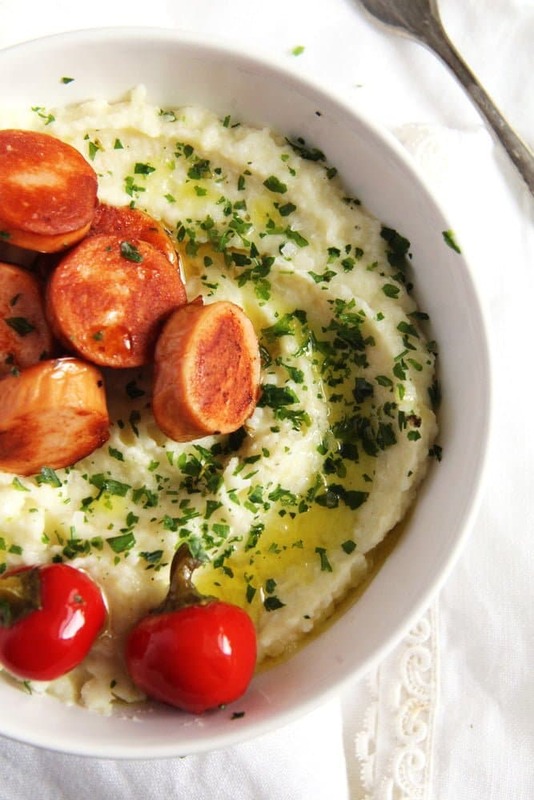 These garlic Parmesan mashed potatoes made with roasted garlic are out of this world. Perfect with any kind of roast. 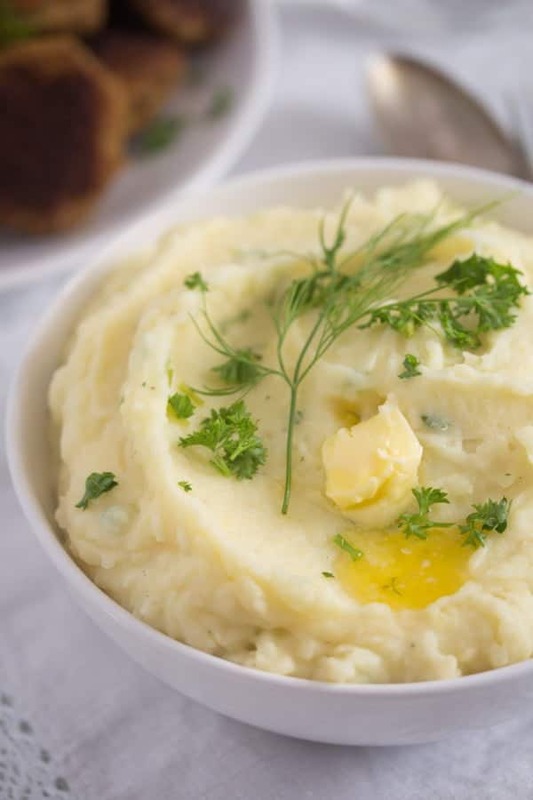 For a lower carb version of garlicky mashed potatoes, you can choose this creamy and wonderful cauliflower and potato mash. Another wonderful potato mash, this time with spinach. I especially love to serve this with fish, but it would be perfect alongside turkey, chicken, beef or pork as well. 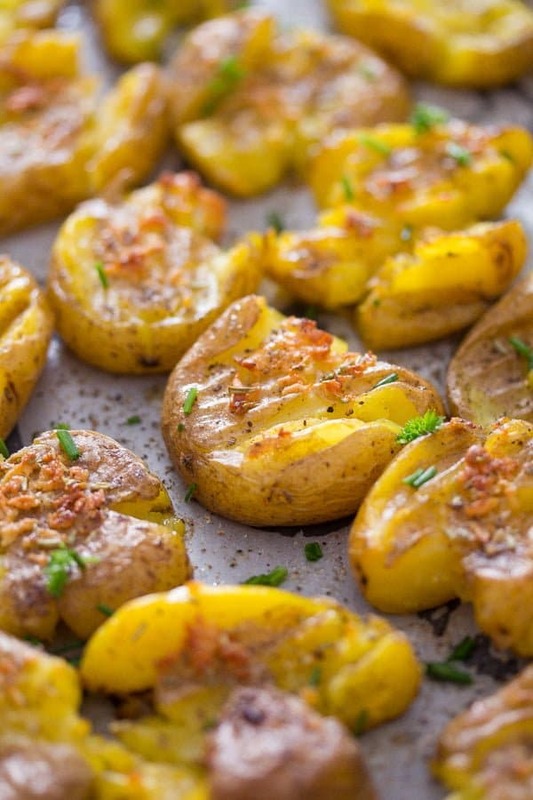 Oven roasted potatoes are always a good idea! 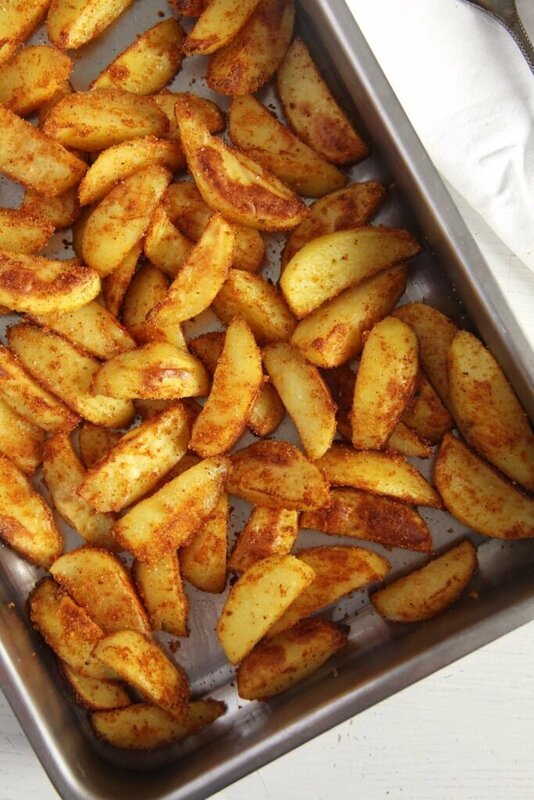 Try these delicious crispy potatoes with a cornmeal and paprika crust. 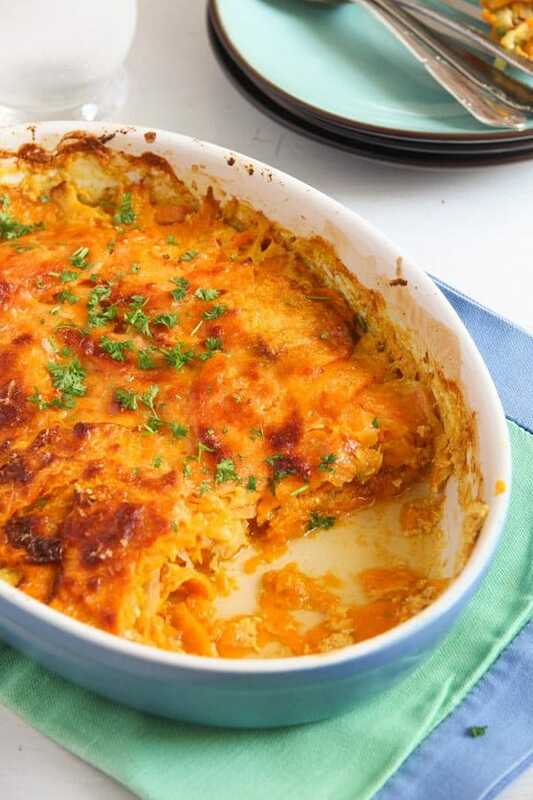 How about a side dish of sweet potatoes, a gratin is always a welcomed sight on any festive table. 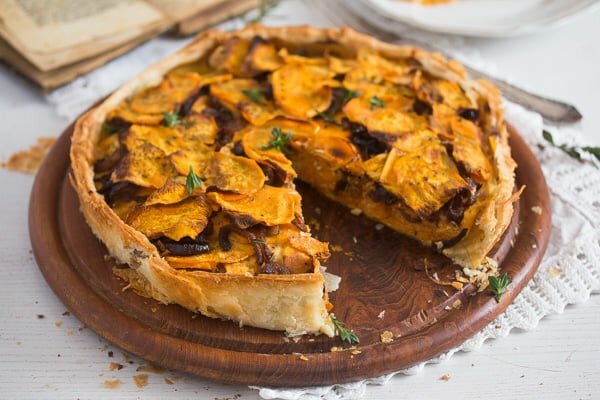 An elegant side dish with sweet potatoes and onions, you are sure to impress with this puff pastry pie. 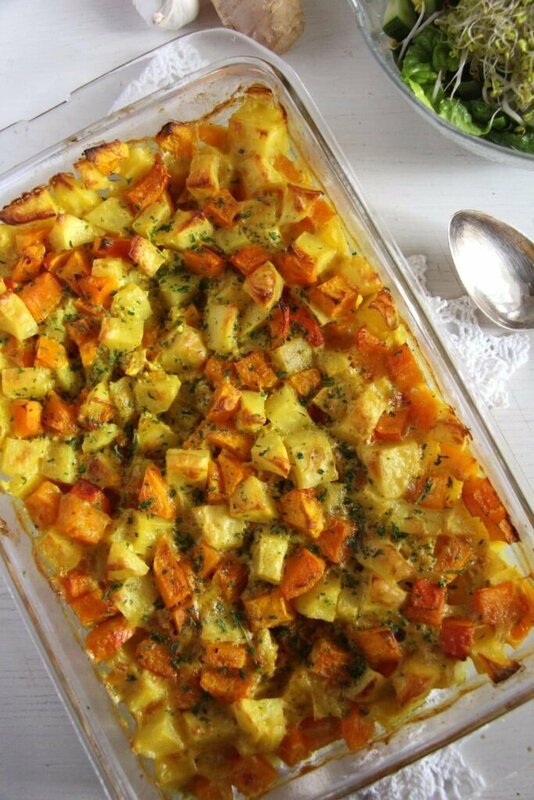 This potato and pumpkin casserole might sound a bit unusual for Thanksgiving, but you should definitely give it try, it is amazing! Perfectly suited if serving dinner for vegans. 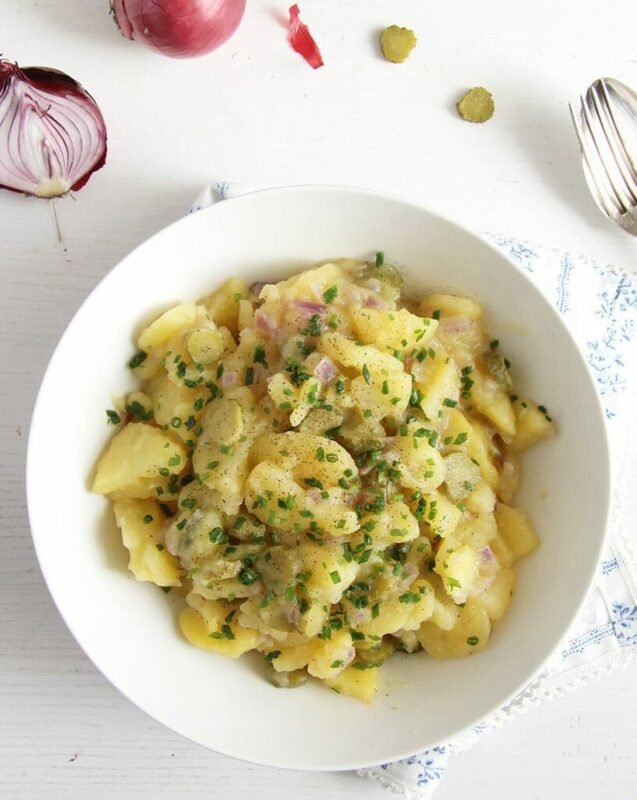 A nice potato salad is always a good idea, even for Thanksgiving or Christmas. The lack of mayonnaise makes this salad lighter and more suitable as a side dish for meat. 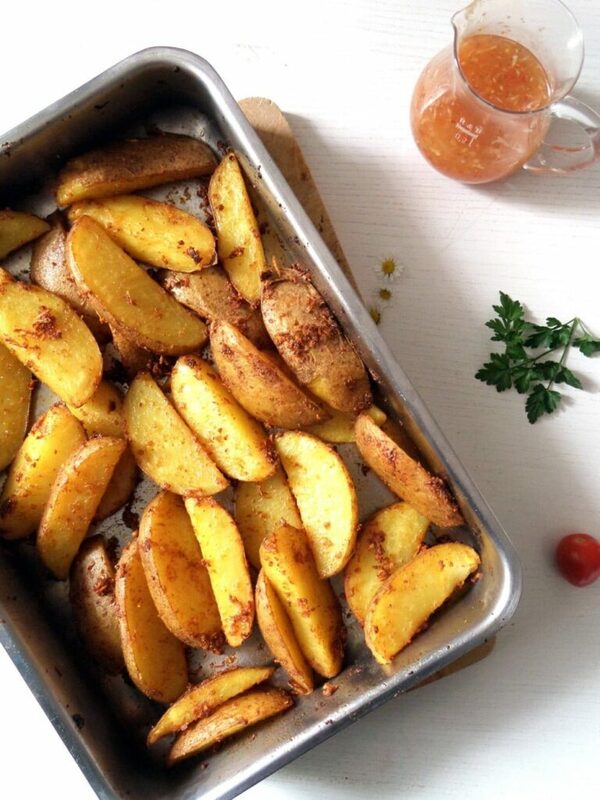 These potato wedges (with or without the chili sauce) are the potato recipe I cook most often, even more frequently than plain boiled potatoes. They are easy to make, versatile and always a delight. Nice collection of potato recipes. 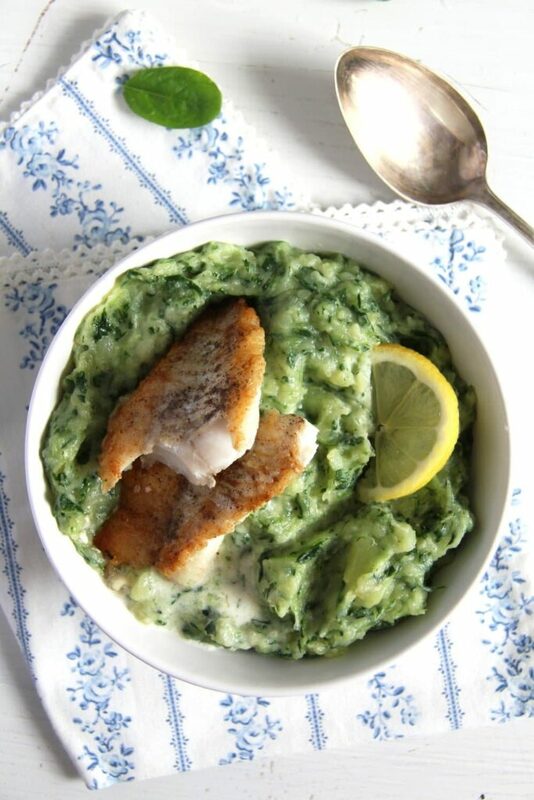 We’re planning to serve fish at our upcoming “American Thanksgiving Dinner”, so the Creamy Spinach Potato Mash looks to be a perfect choice. Thanks for putting this together. Thank you, Ron. I hope you like the spinach potato mash as much as we do. What a great collection of potato dishes, Adina! I would be happy to have any one or two of them at my Thanksgiving dinner! Sometimes I think potatoes are the unsung heroes at the table. I feel the same, Thao, everyone takes them for granted. Everybody says how good the roast or the dessert is, but the potatoes are never mentioned. But they will all notice if they would be not there at all.